So many facts from the internet that heretofore would have passed unnoticed, now cause a ripple of consciousness, a chance to remember or learn something new, even to ponder a new concept. Turns out that Václav Havel, writer and politician was made President of Czechoslovakia almost to the day, almost thirty years ago. Not exactly an anniversary obviously and perhaps not earth shattering to know. But wait, now there’s Google. Although but a mere stripling at the time, I do remember the sense of excitement and wonder when he was spoken of; a writer who became a politician, because it meant a slow unpicking of the Communist stranglehold on ‘the Eastern Block’, when that seemed of paramount importance. Now of course there are other infringements of liberty to worry over. We have reached a workable truce, I think, the baby and I.
What’s that lovely expression from Nadine Gordimer, our ‘covenant of living together’, a phrase that at present I find impossible to let go. When I first mentioned it to Sunny Boy, he immediately thought it applied to him, us, and it does. But oh, it so applies globally, a two way stretch, a fluid working agreement for the mutual benefit of all. I can hear Sunny Boy’s voice of reason in my ear…sounds like compromise which means no one is happy. And yet a covenant implies agreement drawn up between people..signed sealed delivered and promises kept. I will not bomb your children if you do not bomb mine; I trust my government to do their homework on flammable substances and firms who clad buildings (on the cheap?) because they have mine and my family’s and friends’ best interests at heart. In return I will be a dutiful member of society. I will not sell you down river and shaft our peace agreement to further my own ends. And so on. It’s when you reach impasse that troubles start and posturing begins. So many people take up a stance, an intransigent stance and then the outcome is doomed. Whatever led from grandmadom to politics? Working truce. That was it, and compromise. Backing down rather than standing on a high horse, trust, love. Yes, love would cover it. 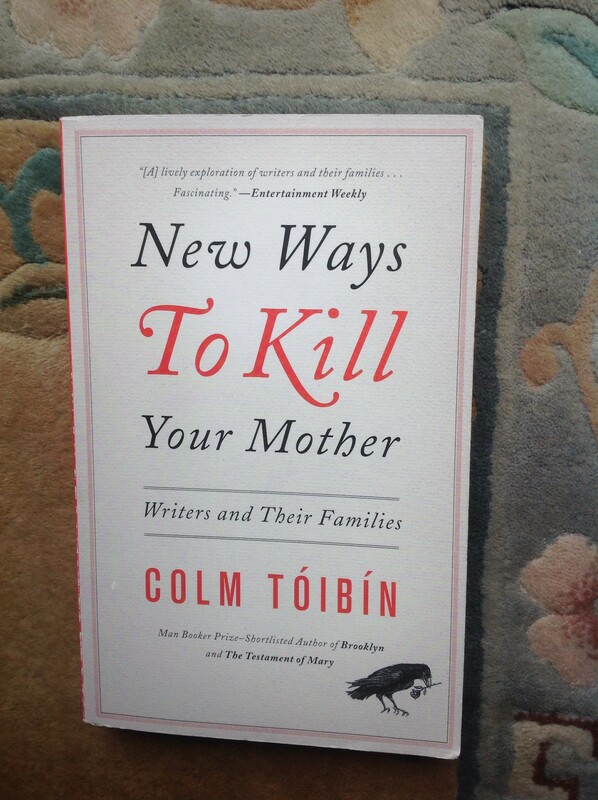 New Ways to Kill Your Mother is an amusing title and choosing it may have been Freudian, an Oedipal take on complex issues, but this behind the scenes look at the family relationships of literati makes good reading. Colm Toibin, close observer of foibles and subtleties in relationships, writes with affection about the writers he has chosen for NWTKYM, Irish in the main for the first part. The political background is as riveting as the family tensions. Private letters reveal petty jealousies visited on gifted offspring and even between the ‘greats’, leaving a desire to revisit the work in the light of these personal disclosures and to read hitherto unknown (by me) work. There is analysis of the way an author chooses to depict fathers and mothers, whether fictional or their own. Intentionally or not, the writer often reveals more of himself than of the parent, so it becomes a dramatisation of the secret self. Or, a wider relationship is revealed becoming a metaphor for political differences that divide families and foster betrayal especially when a country is divided by war. Betrayal comes in many forms from denial of mother-tongue to enforcement of it, control of those deemed suitable companions, control of activities deemed suitable. But when a father betrays a son he violates the oldest law on earth. It may be a political statement but it underlines deep schism, a flaw of character or a national trait. On reading NWTKYM a final piece in the jigsaw of a novel I’ve tried to write fell into place. I know the novel is about families and identity but I had not fully grasped, how much more it is about betrayal. What this says of my secret self, I am not sure. The second part of the NWTKYM branches out into new ways to spoil your children. Fascinating. With New levels of ignorance it is more important to encourage saner, more level, more informed minds. What better way than reading widely. The government make no bones about which texts the nation’s children should and shouldn’t read in a dangerous game of hegemony. Soon it will be left to writers and artists to strike back with more films, more books, more songs to remind us all we are one world. Refugees, asylum seekers, migrants, call them what ever, get a raw deal not only in the UK. This political story for young adults should be required reading for politicians, those who make decisions on our behalf, whether or not we agree with them. It seems in all the policy making, keeping abreast of current affairs and financial doom, politicians (some/most?) have lost the heart of the matter. BZ puts them and us straight without over sentiment. Those who have nothing share their last mouthful. Those who have more, go out of their way to hang on to it at others’ expense.